At the Common Good City Farm in Washington DC, farmers grow food for the community. Communities are starting to recognize the importance of growing their food on empty city blocks or near populated areas. Urban farming is not a new phenomenon. It was used in 19th-century Paris and during the United States’ post-war suburbanization in the 1970s.1 The “French-intensive” method originated in Paris and is now one of the most sustainable forms of organic farming. Its main premise is utilizing cities’ natural waste resources as compost. This garden is able to thrive in a smaller space than its counterpart. The urban farming that took place in the United States in the 1970s was built as a result of the ‘arson plague.’ After the war, factories moved their businesses to the South. This caused unemployment rates to skyrocket and occupancy rates to plummet in inner cities, forcing landlords to burn their unprofitable properties for insurance settlements. 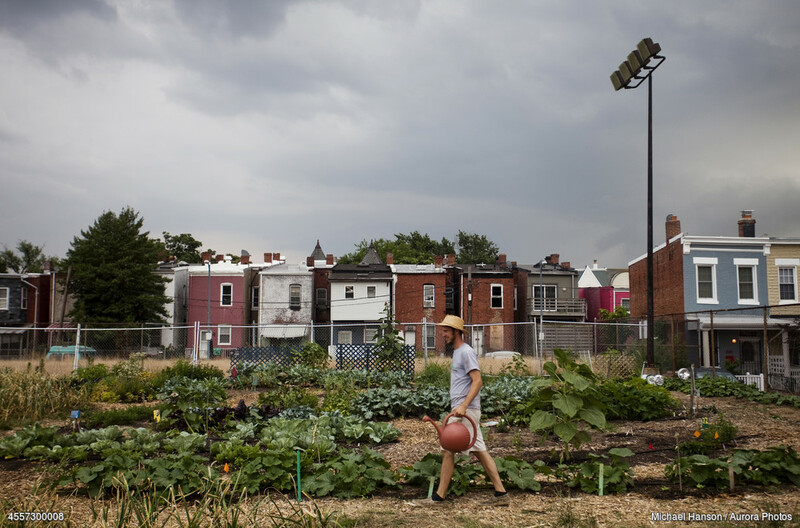 In place of these burned buildings, urban community gardens were born. These gardens turned into a means of combating inflation, environmental problems, and urban decline. Urban farming helps to reduce poverty and food insecurity in urban environments, while improving environmental management.2 One problem in expanding cities is their excessive production of organic wastes and wastewater. Urban farms can use these wastes as compost, similar to the “French-intensive” method mentioned above. As a result, farmers can reduce their use of chemical fertilizers and prevent possible groundwater contamination. In terms of wastewater, farmers may reuse greywater for irrigation with proper treatment. There are also technologies that can be applied to lower water usage, such as hydroponics. Furthermore, urban farms create green spaces that positively impact the city’s microclimate (e.g., lowering temperatures and capturing carbon dioxide). When vacant land is left unutilized, it often turns into a dumping ground. Waste emits methane, a greenhouse gas more potent than carbon dioxide, when it starts to rot.1 Thus, when urban farms replace lots that would have become dumpsites, there are less methane emissions released into the environment.2 Additionally, the production of locally-grown food helps lower energy use that would have been spent in the transporting, processing, and packaging of food. Urban farms have social and economic advantages along with environmental benefits and therefore are integral to creating resilient cities. 1. Philpott, T. The history of urban agriculture should inspire its future. Grist. 2. Urban Agriculture: what and why? RUAF Foundation.